When most people think of Internet marketing, they usually point to desktop computers as the source of marketing efforts, when actually mobile phones are where the majority of traffic online comes from. Smartphones have become an increasingly convenient way to absorb information. Screens are getting larger and processors are more powerful, so browsing the internet is a simple task for any smart phone user. Anything can be done, like online shopping, playing games, and paying bills, all from a tiny hand-held device. 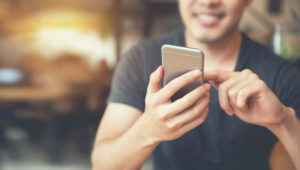 People can also stay connected with their friends easily through social media applications such as Instagram, Facebook, and Twitter. Ready to get started? Envision Marketing Group has experts in all forms of digital media advertising, and we’re ready to help. For more information, give Dan a call at 413-525-6661 x102.